SATURDAY Sleuthing is all about the great history of V8 Supercar racing and indeed all forms of Australian touring car racing – in particular, the histories of the cars that we have watched trackside and on television for years. Some cars, like that featured in this week’s story, are unique for their infrequent trips to the track compared to some of the season-weary workhorses that carve their own grooves into race tracks around the country. The era of privateer cars sometimes fall into the former group – and Perkins Engineering chassis 026 is no exception. Many V8 Supercar fans will remember David ‘Truckie’ Parsons, so-named when he arrived in V8 racing in 1995 to distinguish him from the David Parsons that had been racing touring cars since the early 1980s. Parsons (Truckie that is!) 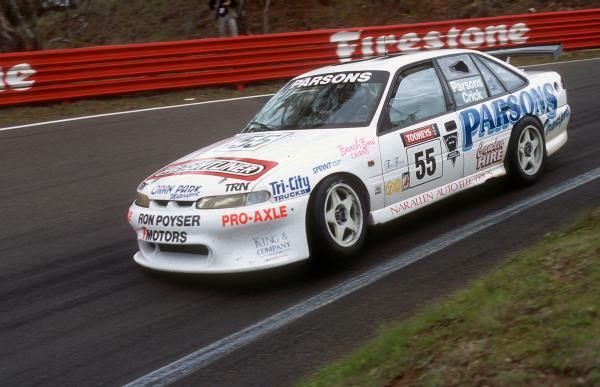 had Larry Perkins’ Perkins Engineering organisation build him a brand new VR Commodore five-litre car in 1995 for his arrival on the local touring car scene. From Castlemaine in country Victoria, Parsons debuted his brand new car (a new VR rather than an updated VP model) at the Mallala round of the Shell Australian Touring Car Championship in plain white colours running under the #55. 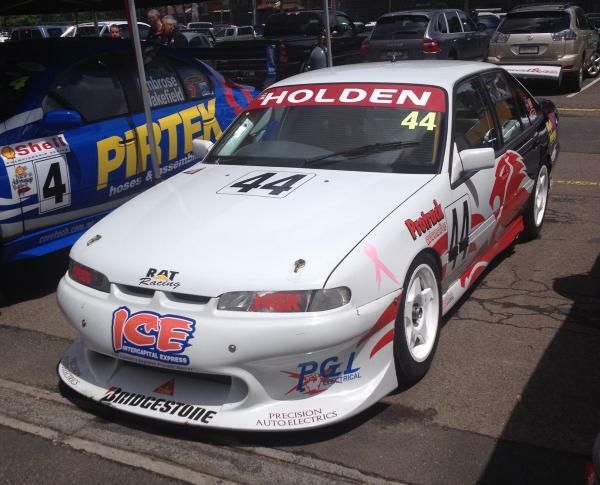 He also ran in the final two rounds of the ATCC at Barbagallo in Perth and at Oran Park (with some more signage from his Parsons Transport business and some others added to the virgin white car along the way) before turning his attentions to the endurance races at Sandown and Bathurst. Two-time Bathurst 1000 winner (and 1972 Sandown endurance race winner) John Goss shared with Parsons at the Sandown 500 after Sports Sedan driver Mike Ceveri was a late scratching from the seat. From what we can gather, it’s the last time Goss raced competitively – certainly at the top level of touring car racing in this country. So this PE 026 chassis has the unique distinction of serving as the last ride for one of the top names of Aussie touring car racing. The Commodore suffered from a misfire for most of the race and also had a brake pad break at one stage! Brake problems would rear their head later on and take them out of the race after completing 126 of the 161 laps when they (the brakes!) went all together at the end of the main straight and Parsons spun into the sand trap and into retirement. Truck racing ace, the late Rodney Crick, joined Parsons for the Tooheys 1000 at Bathurst and the pair of Mountain rookies had a solid weekend. They started the race 17th and were running in 10th on lap 128 when the car suffered suspension failure and pitched Parsons straight into the wall heading up Mountain Straight towards the braking zone for Griffins Bend. The car turned sharp left into the concrete wall at over 200km/h, giving its pilot the fright of his life and causing severe damage to the #55 Holden. Ironically, that crash brought out the Safety Car and allowed the car’s constructor, Larry Perkins, to close from a minute behind the leader to within a matter of only a few cars from the lead of the race. History shows he and Russell Ingall went on to claim victory in that year’s race, though the damage to the Parsons car was later traced to a failure and Perkins’ team thus built a replacement car for their customer for the 1996 season. The salvageable running gear from the Bathurst 1995 car was moved into the new shell, while the crashed shell was then sold to John Faulkner. 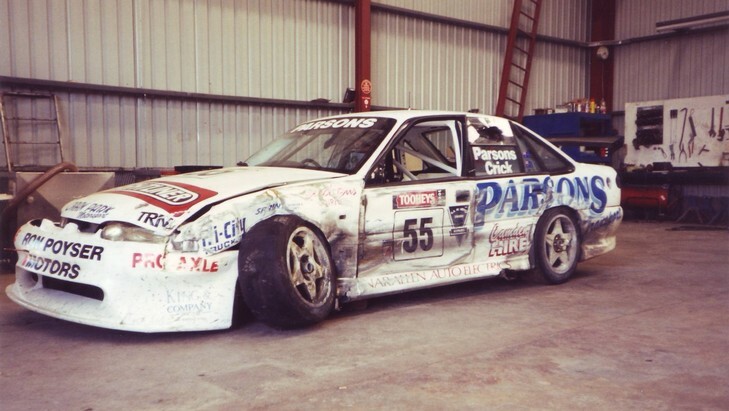 The former Toyota Group A driver had been planning a move from NASCAR to five-litre touring cars and Faulkner secured the chassis with a view to repairing it to join the V8 field in 1996. He eventually did join the field, though in an ex-Peter Brock, Holden Racing Team Commodore, and this shell was sold to HSV Owners Club member Doug Kearney in Victoria. It was repaired and competed in a range of club events and sprints in a red, black and white livery before being sold to Allen Nash last year, who secured a Perkins-built engine to use in it. He displayed his new machine at the newly-formed Australian 5-Litre Touring Car Association’s demo at the Sandown Historics last November and has been busy getting it prepared for this weekend’s Association demo at the Phillip Island Classic where it will be among 15-car field to take to the track. 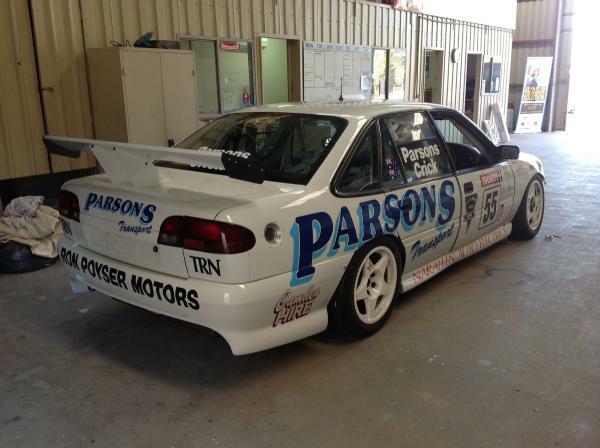 Nash has had Parsons’ original crew in Castlemaine put the car back into its 1995 Bathurst livery and Truckie Parsons himself will be at Phillip Island this weekend to see the car run. The PE 026 Parsons car remains one of the oddities of the five-litre/V8 Supercar era and one of the least-raced cars. It only competed in five events and a total of eight races in the V8 category (3 ATCC rounds in 1995 plus Sandown 500 and Bathurst 1000) but seeing it back on track this weekend is proof that this era of car continues to rise in value and interest. Saturday Sleuthing will take a break next weekend as the V8 Supercars tackle the Albert Park circuit in Melbourne for their non-championship event at the Australian Grand Prix. It will return to the V8 Supercars website on Saturday March 22. Volvo Expects Rivals to "Kick Back"